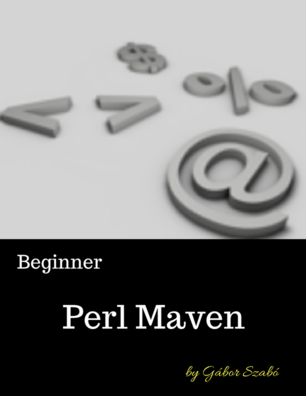 The Perl Maven tutorial will teach you the basics of the Perl programming language. You'll be able to write simple scripts, analyze log files and read and write CSV files. Just to name a few common tasks. You'll learn how to use CPAN and several specific CPAN modules. It will be a good foundation for you to build on. If you are interested in getting updated when new parts are published, please subscribe to the newsletter. There is also an e-book version of the material available for purchase. In addition to the tutorial, the eBook also includes some material that is only available pro subscribers. The updating of Perl Tutorial was supported by a number of people and corporations via a crowdfunding campaign. Some people wanted to stay anonymous, but most of them are listed here. Thanks to all of you for making this ongoing work possible! The Perl Shop also provided substantial support. An extended version of the Perl Tutorial is available as an eBook. It contains all the materials from the free tutorial and a number of additional articles that are only available to the Pro subscribers. In every tutorial and in every book there is a tension between teaching the most modern techniques or teach how the legacy code works. The most recent techniques will only be available to people who can use the most recent version of Perl. They are probably only relevant to new projects. People who need to use older versions of Perl or who cannot install modern CPAN modules will just get frustrated seeing all the nice stuff, but not able to use it. The old techniques on the other hand will allow you to maintain existing applications and will allow you to write new applications on both old and new versions of Perl. The drawback here is that in many cases you might need to write more code, sometimes a lot more code, than you would if you used a recent version of Perl and recent CPAN modules. This tutorial, and this eBook tries to provide a solution to this dilemma by providing both. Telling you about the alternative options and giving advice which one to use in which situation. There is a free video course that includes over 210 screencasts, a total of more than 5 hours of video. In addition to presenting the material it also provides explanations to the solutions of all the exercise. In this tutorial you are going to learn how to use the Perl 5 programming language to get your job done. You will learn both general language features, and extensions or libraries or as the Perl programmers call them modules. We will see both standard modules, that come with perl and 3rd-party modules, that we install from CPAN. When it is possible I'll try to teach things in a very task oriented way. I'll draw up tasks and then we'll learn the necessary tools to solve them. Where possible I'll also direct you to some exercises you can do to practice what you have learned. Traversing directory tree manually using a queue and using find. How to change @INC to find Perl modules in non-standard locations? There is a whole series of articles on writing Object Oriented code, using the light-weight Moo OOP framework or the full-blown Moose OOP framework. There is a corresponding video courses and the whole tutorial is available as eBook.